The National Green Infrastructure Certification Program (NGICP), the first job-training initiative of its kind to certify workers have the necessary skills to build and maintain green infrastructure projects, announced its national roll-out in April 2018. Applicants from around the U.S. can now participate in the program. The National Green Infrastructure Certification Program (NGICP), the first standardized job-training program in the U.S. for professionals working in green infrastructure construction, maintenance, and monitoring, is now open nationwide to partners, trainers, sponsors, and hopeful certificants. 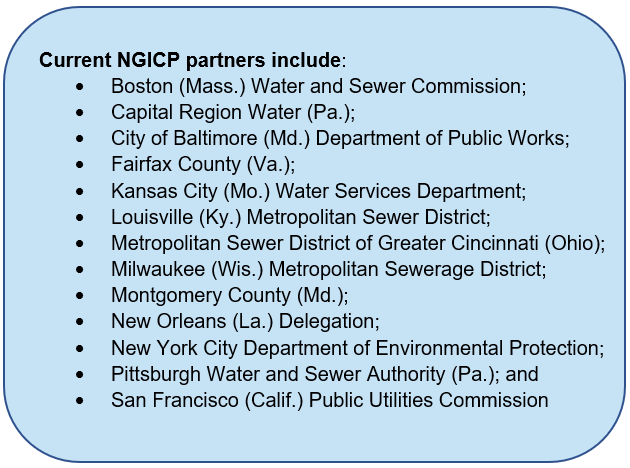 NGICP, founded in 2016 by the Water Environment Federation (WEF; Alexandria, Va.) and DC Water (Washington, D.C.), promotes a skilled green workforce, streamlines the process of connecting qualified talent to in-demand jobs, and supports community-based job creation in U.S. cities. To coincide with NGICP’s national launch, Adriana Caldarelli joined WEF as the Director of NGICP. Caldarelli brings 17 years of experience at the New Jersey Department of Environmental Protection (NJDEP) to the position. In the past, NGICP training and examination sessions were available only in communities served by WEF, DC Water, and the 14 utilities and water-sector organizations that assisted with the program’s development. Utilities and organizations nationwide can now become NGICP partners to gain the resources to train and certify green infrastructure professionals in their home communities. Organizations interested in supporting the NGICP mission also can help sponsor the program. Already, more than 250 applicants have received credentials through NGICP. Many of these professionals now work permanently in their fields of study. 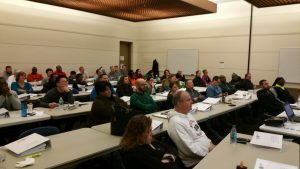 As more individuals become certified, the program is attracting national attention. In March, The Washington Post commended the program for its efforts to reduce unemployment while improving local communities. NGICP partners worked diligently to build the NGICP curriculum and 100-question examination to meet international best practice standards. The program verifies that credentialed green infrastructure workers have the necessary skills to ensure the performance and sustainability of low-impact stormwater infrastructure. With the arrival of Adriana Caldarelli, who played critical roles in water quality regulation and stormwater management programs at NJDEP, NGICP gains a director well-versed in addressing complex environmental issues and engaging communities. Before 2011, the City of Camden had been plagued by chronic flooding due to its undersized combined sewer system. That year, Caldarelli worked with others at NJDEP to broker partnerships with Camden County Municipal Utilities Authority, Rutgers University Extension Station (New Brunswick, N.J.), and several local nonprofits, establishing the Camden Stormwater Management and Resource Training (SMART) Initiative. 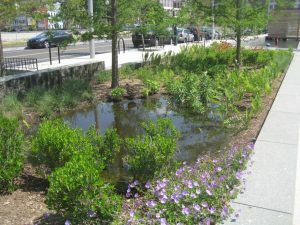 Camden SMART mobilized community resources to build approximately 50 green infrastructure projects and plant more than 1500 trees around the city in the years since, capturing more than 234 million L (62 million gallons) of stormwater annually, Caldarelli said. Through such projects as building a new waterfront park on a former industrial site on the shore of the Delaware River and distributing free rain barrels to Camden residents, Caldarelli has witnessed firsthand how green infrastructure can transform the environmental, economic, and social well-being of neighborhoods. To provide these benefits, green infrastructure requires specialized construction practices and regular maintenance. “As great as green infrastructure is, it has to be properly installed and maintained,” Caldarelli said. NGICP offers green infrastructure owners and planners a way to locate the right talent to ensure these installations operate as intended. The NGICP team will now work to increase the burgeoning program’s name recognition throughout the U.S. by engaging a wider variety of water-sector organizations. As a former regulator, Caldarelli will lead the partnership’s efforts to integrate NGICP certifications into state and local environmental standards. The partnership also intends to work with workforce-development organizations that focus on chronically disenfranchised workers, such as veterans’ assistance and prisoner re-entry groups, Caldarelli said. Learn more about the National Green Infrastructure Program on its website, and contact ngicp@wef.org for more information.